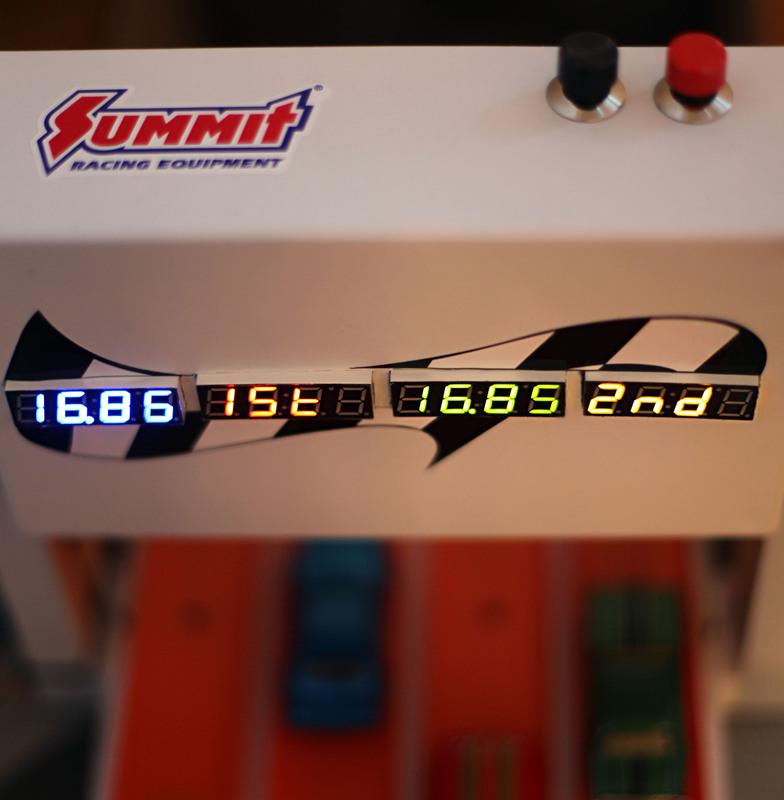 For my son’s second birthday I decided to introduce him to die-cast cars and what better way than building a drag strip race track with an electronic start gate, timing and race results? 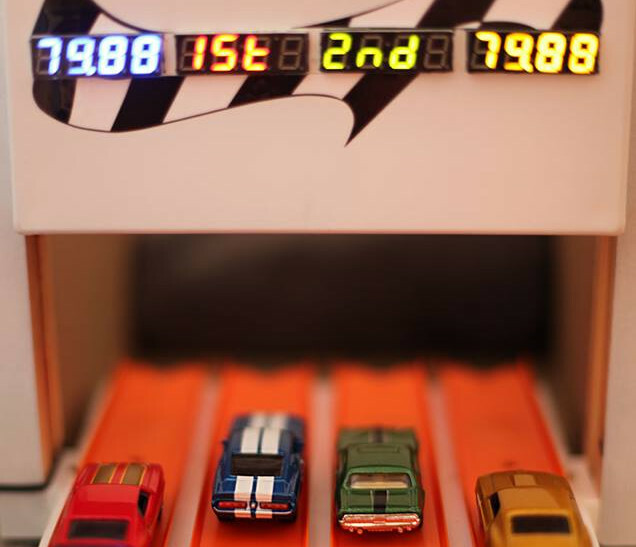 While Hot Wheels does offer a 6-Lane Raceway and a number of other drag strip style tracks, they didn’t have the timing and electronic start gate that I knew an Arduino and some other bits could provide, so I set to work. The basic idea is was have a servo motor open the start gate by pulling down a hinged plate with dowel stoppers to release the cars and a photocell (photoresistor/LDR) pointed at an infrared LED on each track to detect each car crossing the finish line. 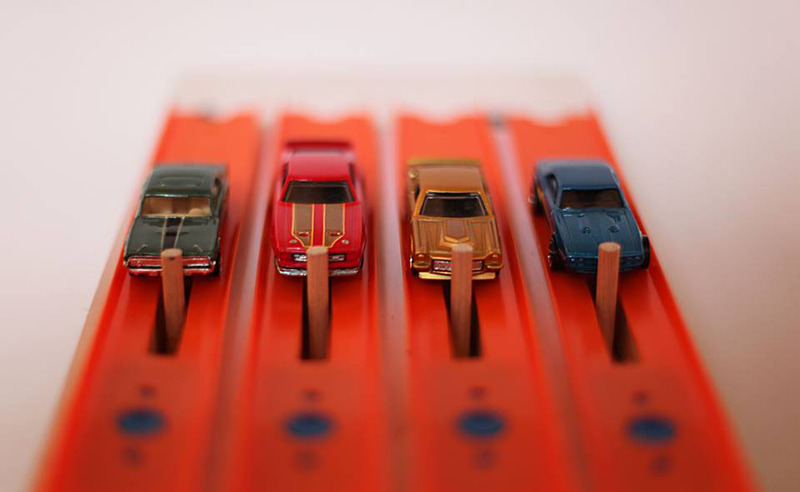 Some quick searching revealed a number of projects from which I could draw insight and inspiration, most useful were apachexmd’s Hot Wheels Track Timer and Robby C’s Ultimate Guide to Building a Hot Wheels Race Track. This demystified a number of points, I hadn’t really had any fun with die-cast cars since I was kid myself, turns out there are some oddities. One of the oddities is that Hot Wheels doesn’t offer any long track for sale, all of their tracks are sold in segments a foot or two long that must be connected — the only exception being a vintage 50-foot Track Pak Raceway sold at some point in the 70′s or 80′s which can be found for upwards of $100 currently. Another track option is BluTrack which is sold in many lengths but only in a two-lane configuration for some reason. I decided to buy the readily available Hot Wheels segments in the form of 4 Hot Wheels Track Builder Straight Track kits. 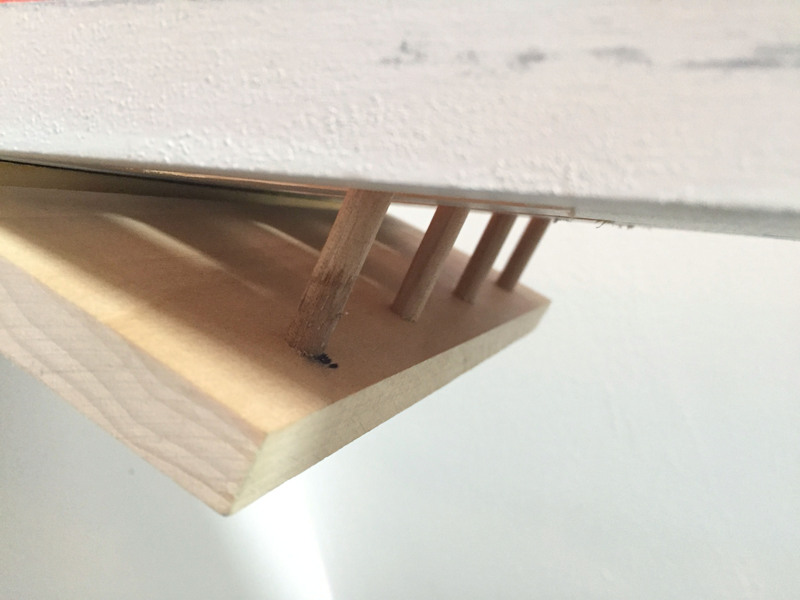 I had some 1/2″ x 8″ pine left over from framing a door I thought I would use to mount the track on. 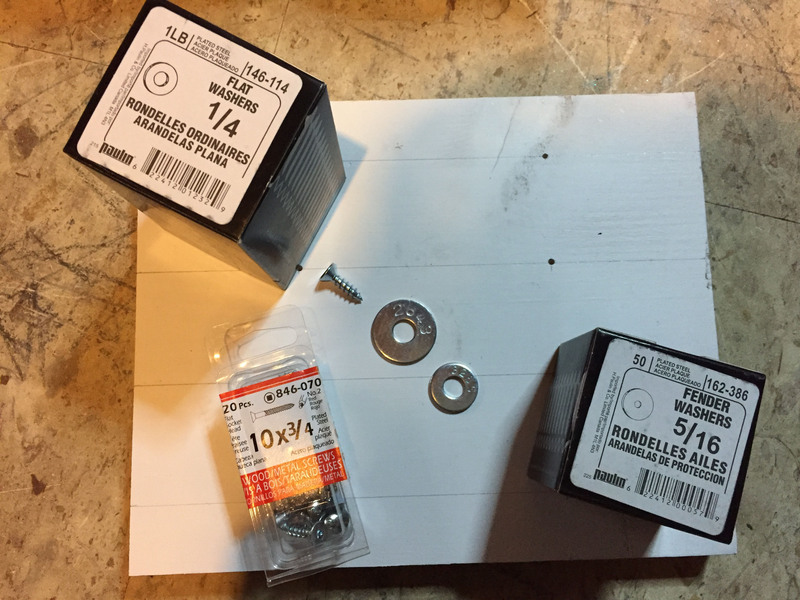 There are a number of methods folks have employed to mount the Hot Wheels track on wood, I decided to use a method mentioned on Robby C’s page which involves using screws to secure a stack of two different sized washers to the wood at intervals. A small washer below a larger one provides the elevation that the track needs to slide onto the larger washer. 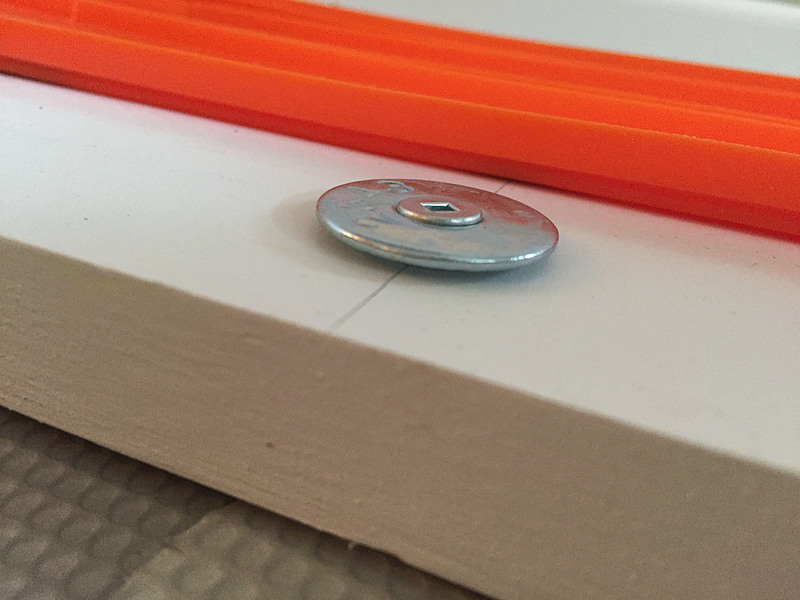 The exact washers and screws I used can be seen in the gallery below, be sure to drill pilot holes for the screws and try to keep them straight, the straighter the screws are, the better they will fit in the washer and, in turn, the smaller the bump in the track will be. This method (at least with the sizes I used) does leave ever so slight bumps in the track once it’s fitted, but I felt it was slight enough that it wouldn’t adversely affect the races. 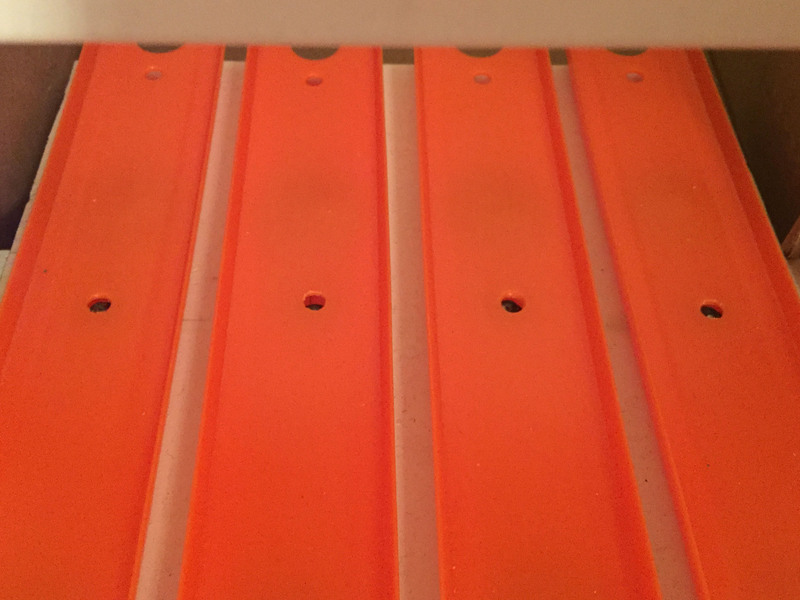 I used one of these washer guides for each section of track positioned to sit in the center of the track, except for the finish line track where I placed one at either end. The track has 4 main pieces (though one I cut into two to make it more modular). These four pieces are a small section of track for the finish line which has the results display attached, the main straightaway, the start incline and a support for the start incline. Following some of the ideas on Robby C’s page again I decided to use hinges to connect the start incline track to its support piece as well as to the straightaway allowing for an adjustable incline. If you use hinges with removable pins it allows for easier disassembly. 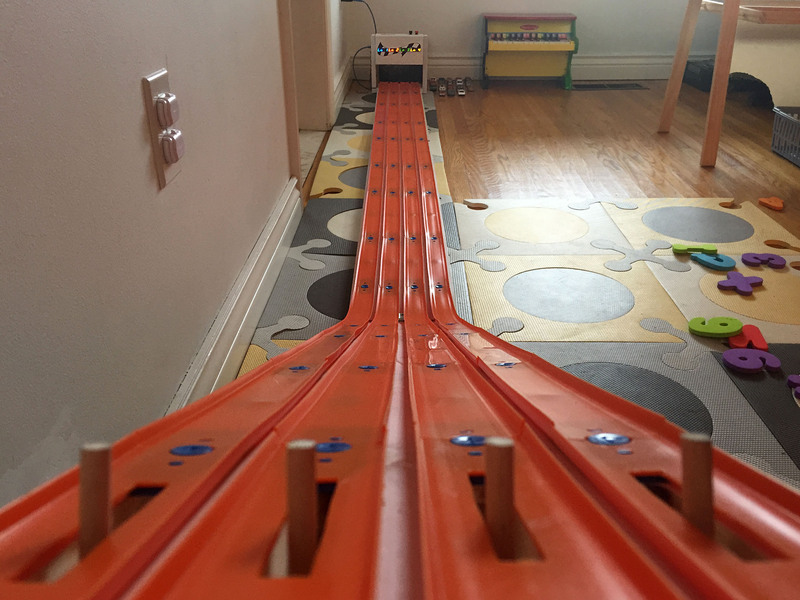 I ended up cutting the straightaway into two sections, and I’ll probably do the same with the incline so that I can make the entire track shorter and thus more palatable in the living room. For the joint between the incline and the straightaway I made sure that no track joints would run across the curve allowing for the longest pieces of track at this joint and thus a smooth transition for cars from the incline to the straightaway. The flat joints I cut where the tracks connect, this makes disassembly a bit easier, but I’m not sure it was the right choice as some of the wood warped and having a track joint and a wood joint at the same spot may not result in the smoothest run. 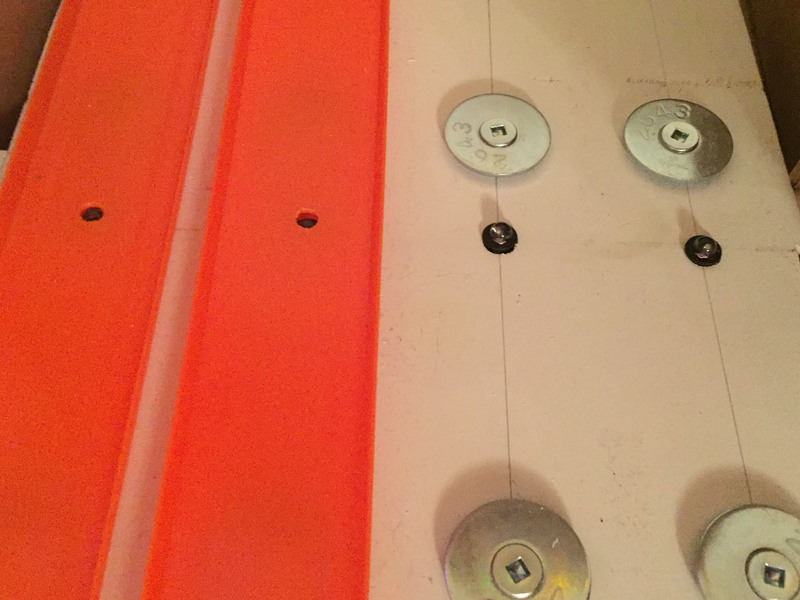 Experiment with the hinges and see which orientation works best for your setup. 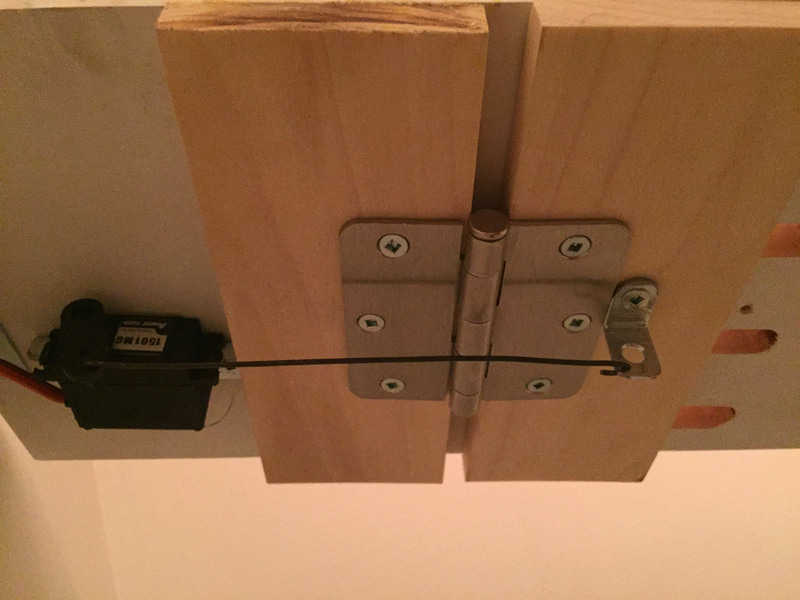 The start gate on this track uses a high torque servo to actuate a hinged plate that has 4 wood dowels inserted into it. 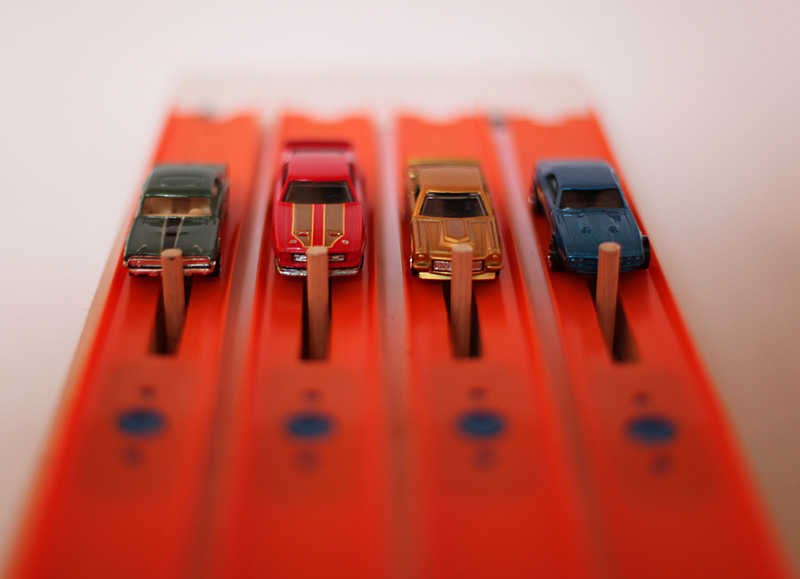 The dowels feed up through routed slots in the wood and tracks to hold the cars at the start gate. 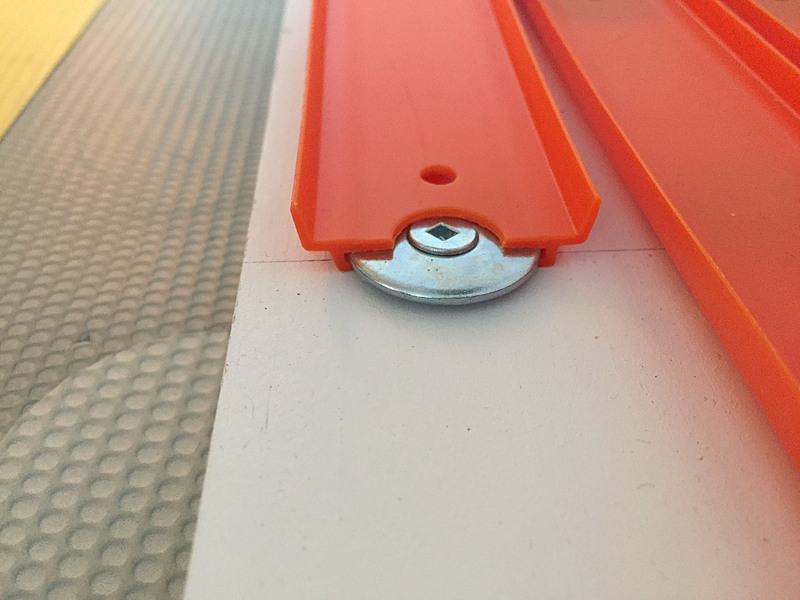 The Hot Wheels tracks can be cut easily with a sharp exacto, though it’s difficult to get the corners of cuts perfectly smooth. The track can also be drilled, one method is to drill an appropriate diameter hole at either end of the route you wish to cut and then connect the two holes with a single exacto cut on either edge. To start the race the servo pulls a stiff wire which is connected to the hinge plate with a small L-bracket, this pulls the dowels back down through the routed slots and releases the cars. The slots I routed in the wood were 1/2″, the track slots were a little smaller than that, somewhere between 1/4″ and 1/2″ as the dowels themselves were 1/4″ diameter and needed some clearance to move smoothly. 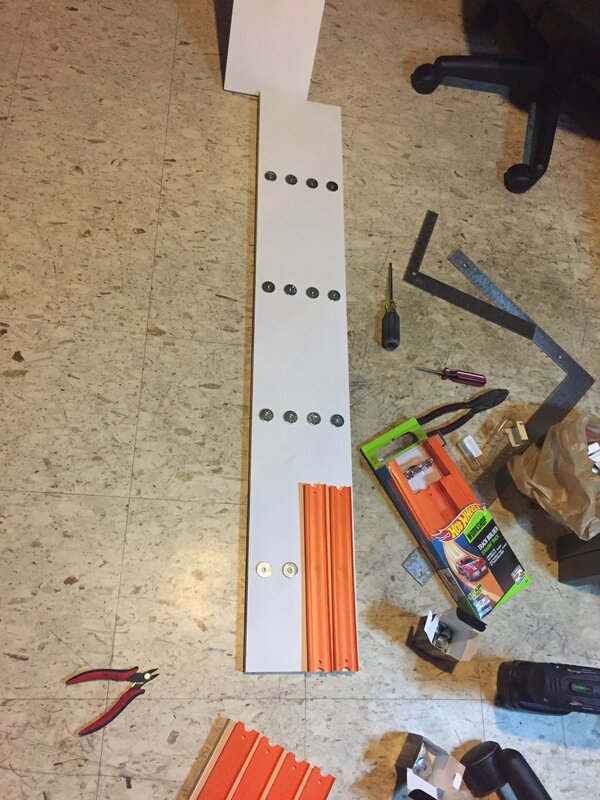 The dowels are simply friction fit into drilled holes. 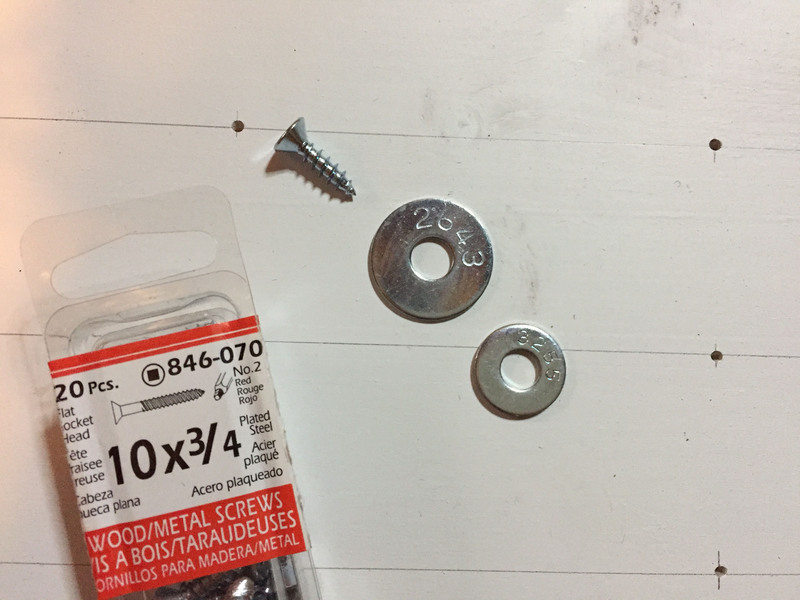 It may not be obvious from the video and photos, but I drilled a small hole in the L bracket which fit the wire much better than the large screw holes. This prevented any extra travel of the wire at the hinge plate connection when the servo actuates. The wire I used to connect the servo to the hinge plate is a malleable steel of some sort, when my son decides to push or pull on the start gate hinge or dowels it will bend this wire rather than stress the servo, after which I inform him that is not how it’s suppose to function and bend the wire straight again. For my setup a run-of-the-mill servo wasn’t strong enough to push and pull the 1/4″ wooden hinged plate so I picked up a high torque servo. If you made a lighter, thinner hinge plate you may be alright with a weaker servo. Robby C mentions something about this type of drop-out start gate being not as fair as a gate that lifts rather than drops, but I’m not sure why that would be — in any case, my goal was not to create a track fit for the world cup of die-cast racing. A lift gate would have required more fabrication, so I opted for the simpler drop-out. 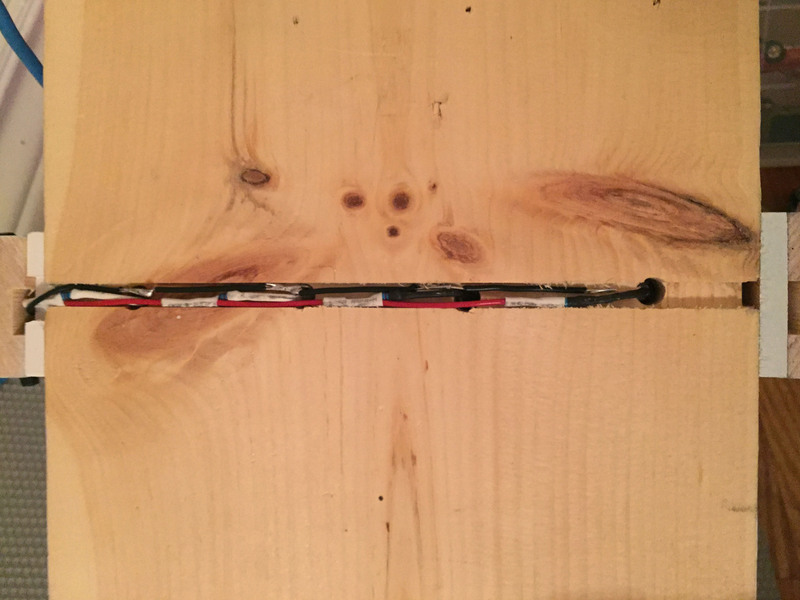 The finish line employs 4 photocells, also know as photoresistors or LDR’s (Light Dependent Resistors) which sit in an enclosure above the track in holes drilled into a piece 1/2″ piece of wood. These photocells point down through the drilled holes, through larger drilled holes in the enclosure at 4 infrared LED’s embedded in the wood under the track and aligned with holes in the track above. 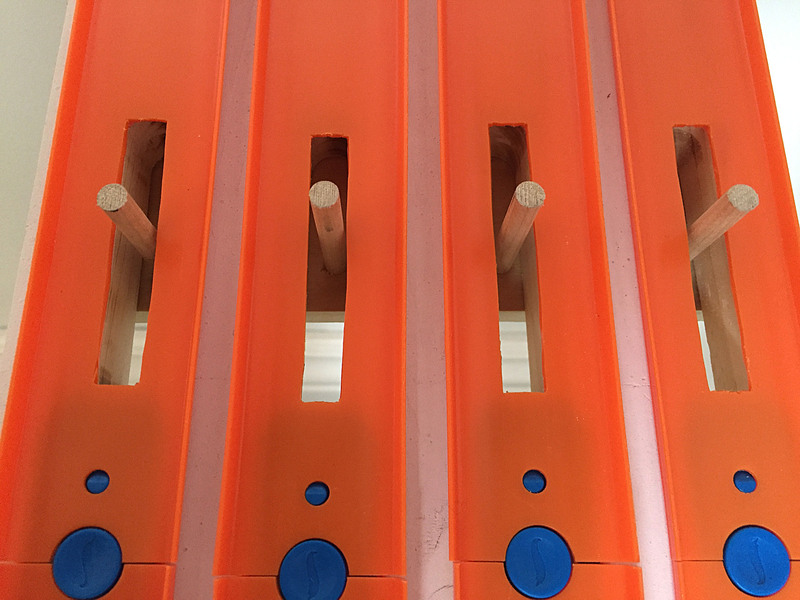 Placing the photocells in holes in the 1/2″ piece of wood keeps them focused on their respective infrared LED underneath without picking up a lot of ambient light. While the infrared LED’s don’t produce any light visible to the naked eye, they are detected by the photocells and when a car passes over the infrared LED, the reading on the respective photocell drops dramatically and thus the Arudino brain can determine when each car passes the finish line by waiting for the photocell reading to drop. Embedding the photocells into a piece of wood also allowed me to align that wood with holes I drilled in the track wood for the infrared LED’s before placing the wood, along with the photocells in the enclosure. Once I’d aligned the wood, I drilled holes in it for the photocells, wired up the photocells and placed that entire piece of wood into the enclosure. 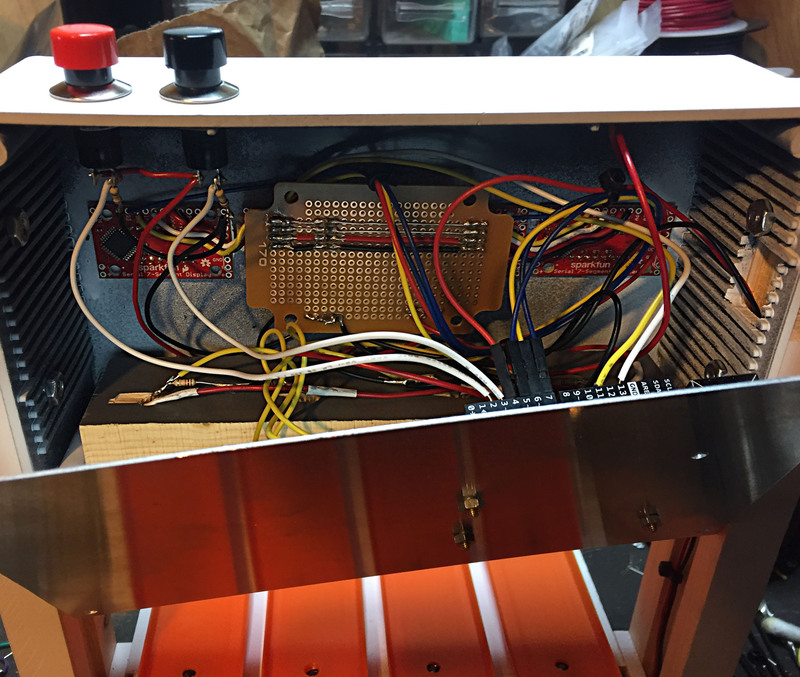 The holes I drilled in the enclosure were much larger and thus I had room to align the wood with the photocells to the infrared LED’s without having to worry about aligning exactly with the holes in the enclosure. I wrote a specific Arduino sketch in order to align the photocells which wrote the photocell values to the computer via a serial connection. 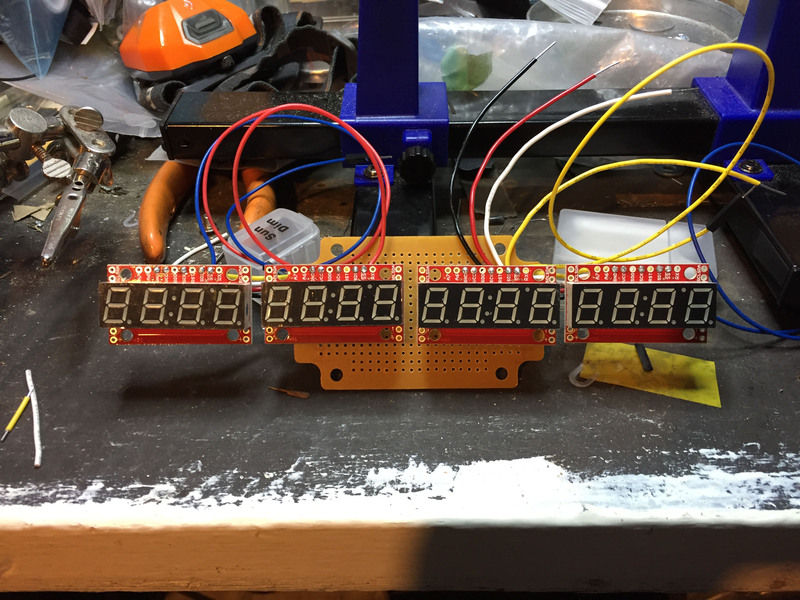 Since then I have added a debug mode to the race track, pressing both the start race and track reset buttons simultaneously will engage the debug mode where the Arduino will write the photocell values out to the 7-segment race result displays so that I can check the photocell alignments. One of the issues I ran into was that it seemed the power needed to actuate the start gate servo would draw too much from the rest of the circuit causing the infrared LED’s to dim and trigger the photocells. To get around this I added a 150ms delay to allow the circuit to recover after opening the start gate. 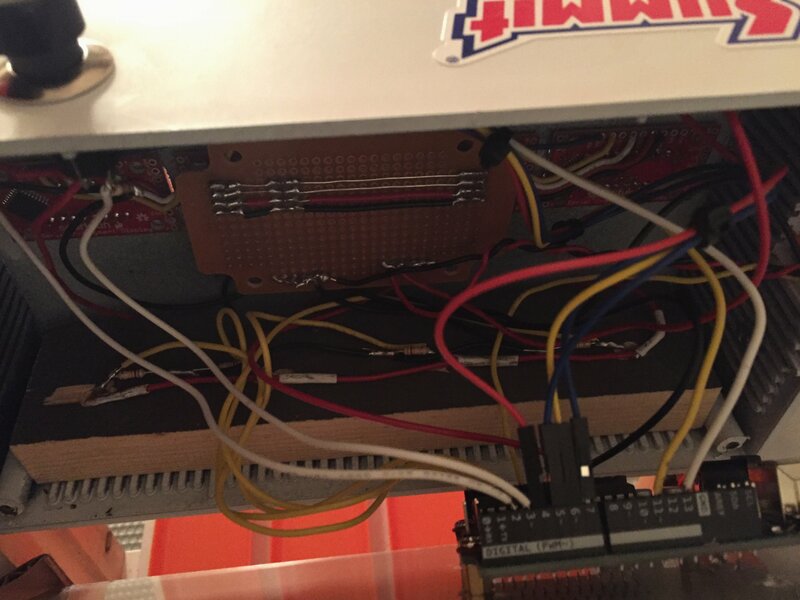 None of the electronics used in the project are very complex. I collected various components mostly from RobotShop, SparkFun, Creatron and locally. 4x Infrared LED, *For maximum brightness I used a 100ohm resistor with each LED, though your LED specs may vary. These components and their circuits are all connected to the Arduino which runs the sketch at the bottom of this post. If I get a chance to draw one up, I’ll post a circuit diagram. After purchasing a good starting set of cars to go along with the drag track I needed some way to store the hoard. It seemed likely that a generic storage container would do the trick as long as the compartment sizing matched. I wasn’t all that pleased with the purpose-build die-cast storage containers. 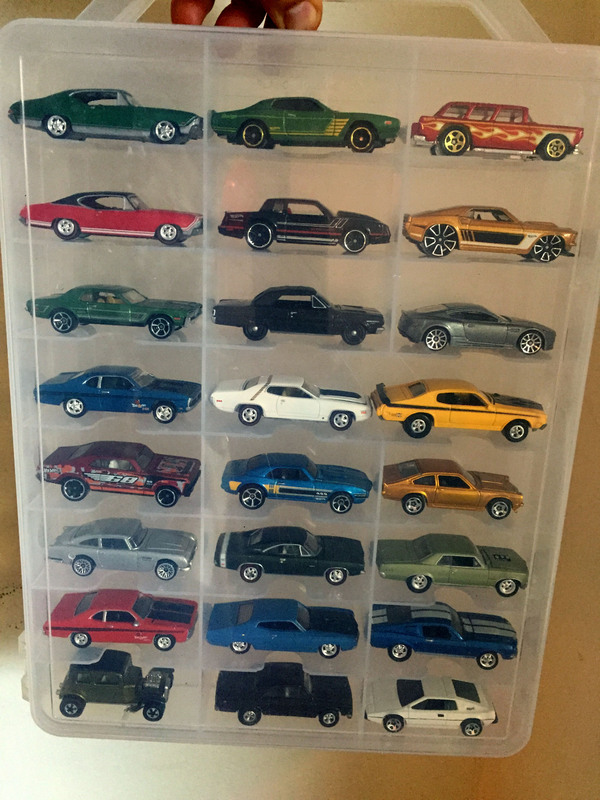 A little bit of searching revealed this Creative Options Thread Organizer which fits 48 cars almost perfectly. It’s only half-full in the photo below, with the same number of compartments on the reverse side still to be populated. 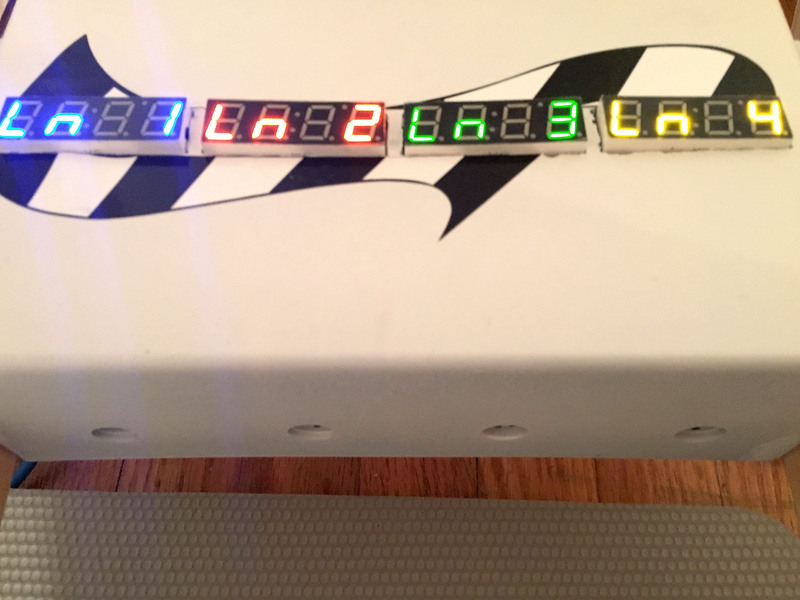 While it turned into a race to finish this project in time for my son’s birthday, I had initially intended to integrate a Raspberry Pi to record race statistics and another fun function, but I’ll leave that to everyone’s imagination until I get around to implementing it. The whole setup could also use some Hot Wheels stickers. 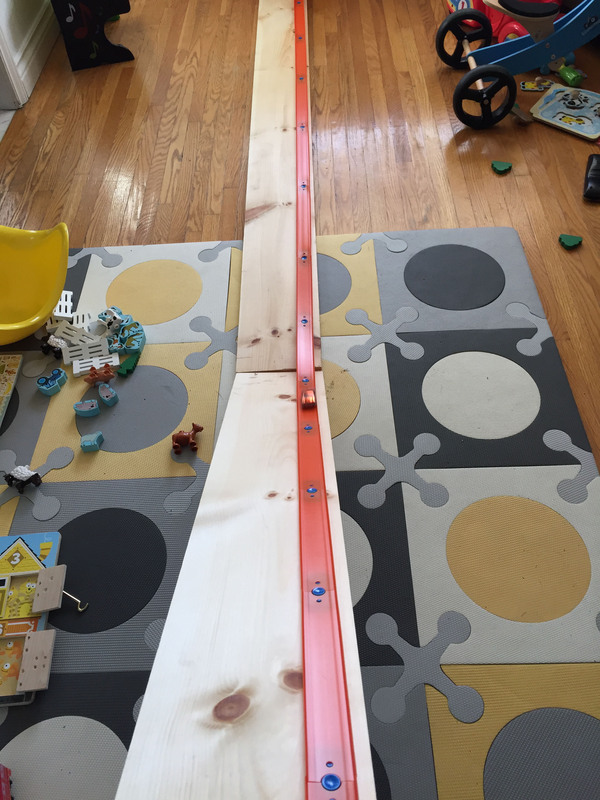 I’ve since removed a section from the start incline and the straightaway to reduce the overall size of the track in order to move it to a more permanent location (rather than across our living room). Below is a short video of my son operating the shortened track, he doesn’t seem to mind the change and still enjoys the track quite a bit. // Magical sprintf creates a string for us to send to the s7s. //  The %4d option creates a 4-digit integer. // This custom function works somewhat like a serial.print. //  the first 4 characters in the array. // Turn on any, none, or all of the decimals. //  (or colon, or apostrophe) on or off. A 1 indicates on, 0 off. How if i want to build into 6 lane,does the script becomes more complicated or i just add 5th and 6th lane into every cmd line? Can it connected to grandprix race manager software to record the result? There’s no serial output for use with the USB connection currently but that could be written in. Extra lanes shouldn’t be a problem, though it may require a larger Arduino-style package with more inputs/outputs I’d have to go over all the connections again to ensure the Duo has enough for two more lanes. I’m a noob with arduino, do you have schematics for this project? how all need to be wired and so? Hi sir. Great project. Can you share the schematic diagram? I don’t have a schematic, if I get some time I’ll try to whip one up. If you combine the Arduino examples I’ve posted it’s really quite simple. Try them on a bread board one by one, then add them together. I loved the arrival and arrival with sensors and speed meter. You sell it please ..
Do you have the wiring diagram for this build?